Trying to stay on top of dozens of feeds can feel like trying to squeeze a river through a kitchen strainer. I used to be a NetNewsWire guy, but I switched to Google Reader this summer to simplify switching between multiple computers. At first it exacerbated the feeling that for what little info I could process through that strainer, I might as well just give up and let it flood the place. Unlike more powerful desktop readers like NNW, Google Reader doesn't give you any options to control the refresh rate of feeds, how long they stay in your queue before disappearing, etc. So if I missed a day, or even a few hours without checking in, hundreds of unread items would keep piling up, with no chance of my ever finishing them. So I started marking hundreds of items at a time as read, and sure enough I felt better. It was like dipping a bucket in the river instead of trying to drink the whole thing, and after a few days I realized it was okay to let a few things pass me by. 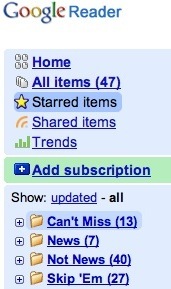 The magic trick for me though, has to do with how I group the feeds in Google Reader. This can be accomplished with any modern news reader, but the Google's does things in a particular way that really hits a sweet spot. When given the option to group things, we tend to do it topically, with labels like "Sports," "Technology," "Blogs," etc. For years, I lumped my feeds into folders like this, thinking it would help me manage them, but all it did was help me ignore just how many I'd subscribed to by tucking them away in folders. I still looked at the growing numbers of unread items and felt that endless sense of dread that I would never finish. News - Self-explanatory, but specifically feeds from traditional news outlets like the New York Times, BBC, et al that pump out so much stuff I can't possibly hope to keep up. I usually read this group starting with the newest items first, and stop and delete the rest when I get tired. I won't miss anything; if I get behind, most of those items are either updates on breaking stories, or tidbits I've already heard elsewhere on TV or the radio. Can't Miss - Again, pretty obvious, but these are my favorite sites, ones where I want to at least scan every single item, like blogs of friends, publications where I write, etc. Not just anything can go in here--this group has a high barrier to entry to keep its volume manageable. Skip 'Em - The aforementioned feeds that I like to read when I have time, but don't mind missing either. Grouping them together like this makes it easy to dump them en masse on one of those days where I just don't have the time or energy. However, this shouldn't be an excuse to subscribe to every bleeping feed you see; I still try to keep this bunch to a minimum. Not News - This is a combination of the Can't Miss and Skip 'Em groups. I usually like to read the standard news over breakfast, then save this one for later. It also makes a nice subset to peruse later in the day when I've had my fill of the ticker tape feeds. This is another area where Google Reader helped out, because it uses a tagging model that makes it easy to group things in multiple folders. Again, nothing revolutionary, but it's made my daily information gathering process more manageable, namely because it gives me an easy way out when I've fallen behind. The obvious alternative to all this would be to simply cut the number of feeds I try to follow, and I wholeheartedly agree. Like I said, I have a pretty high threshold for what gets into the club, and keeping things in that Skip 'Em folder makes it easy to identify which ones might be on the chopping block. But this approach gives me the latitude to read broadly in a number of subject areas and still focus on the most important stuff. The fact that I felt compelled to write about this is quite ridiculous, really. I've taken what should be a leisurely activity and turned it into a dull process. But I also realized that I derive a lot of pleasure from reading all these news sites and blogs, and there was no sense in depriving myself. The dull process has kept it enjoyable. Submitted by ckb_nc on December 6, 2007 - 12:28pm.